Last week I attended Ampersand conference in Brighton for the day. It was a real treat, lots of new ideas, lovely people and rounded off with a couple of cold beers. 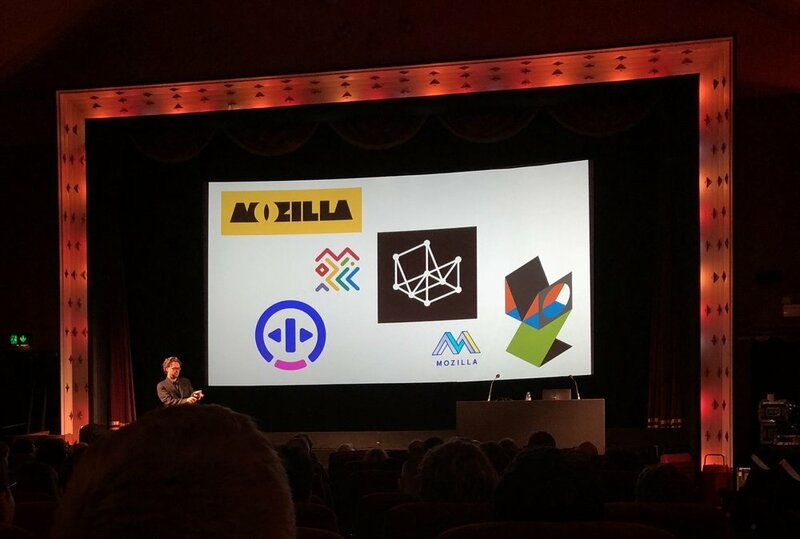 The talks were kicked off by Michael Johnson of Johnson Banks, a brilliant small branding agency that consistently produces big, brilliant work. He took us on a typographic tour of his output, exploring how type can blur with brand to create character and distinctiveness. 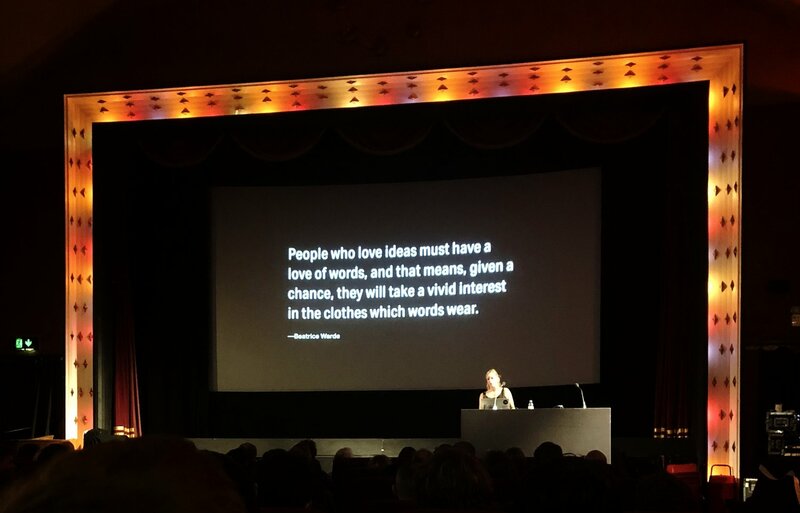 A typographic voice – something that can sing when expressed with single-mindedness and clarity. As part of the talk Michael showed the work they did for Mozilla. 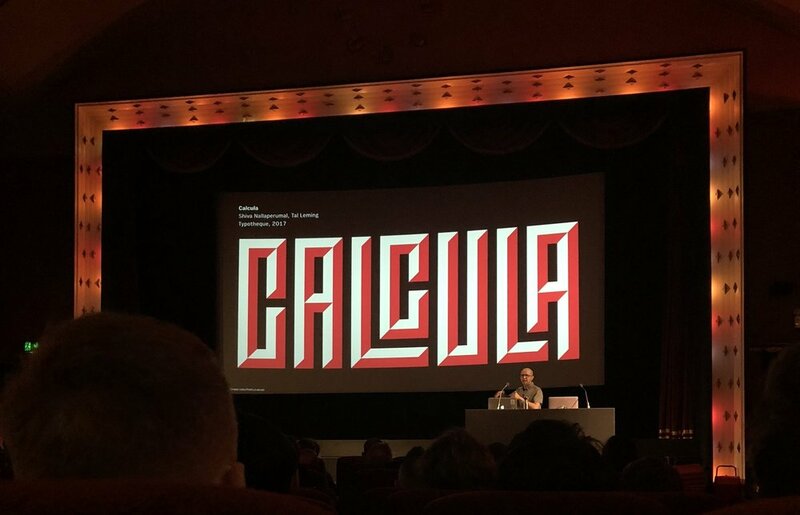 I love the logo and type treatment, but more than that (and I should probably use another blog post to go in to this in more detail) I really love the process they used to get to their solution. The entire job, from strategy to final designs, was done in the open. For such a high-profile job that so many people care deeply about, this was brave. In branding, an industry that tends to do things behind closed doors, it was near revolutionary. I have so much respect for them for helping to making that project so open and transparent. 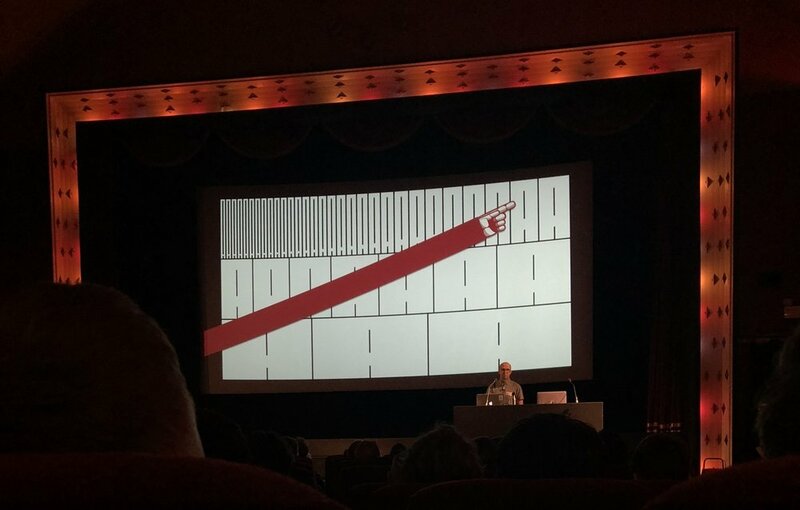 Another key theme for the day was the potential of variable fonts. "They're coming, but we we're not sure what they're good for yet" seemed to be the main takeaway. Variable fonts are like ordinary fonts but with superpowers. Traditionally a font can come in a range of weights or widths, and a separate file is required for each – this can make them prohibitively large in terms of file size for use digitally. Variable font can package a range of weights, or widths in one file, making them much more compact, potentially giving designers much more range for expression in digital applications. We saw some lovely experiments. Bianca Berning talked about how they can help justify text with less wasted space. You might ask why this is a concern in digital applications where "space" is more or less infinite. The answer lies with the user and their reading experience, less wasted space gives the text a much more even appearance, making it much easier to read. 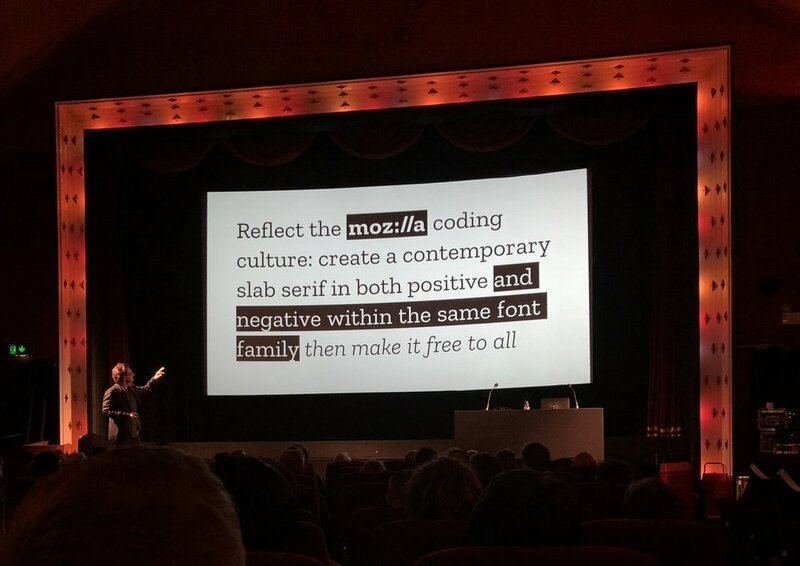 Variable fonts can help make these efficiencies by giving designers another tool, previously you would only really adjust the space between words, now there's the possibility of using characters of very slightly different widths as well (something so subtle it would be very hard for the reader to spot). It also looks like variable fonts can help make typography in Augmented Reality more robust and legible. These fonts show more dramatically the potential for variable fonts. I love Fit, a typeface which which adjusts its characters widths to fit to any space it's given – and it does so it a really lovely way. Not at all legible as this feedback to the type designer indicates, but a brilliant bit of exploration. The talk that really blew my mind was by Jen Simmons who demonstrated new design tools that are being developed by Firefox. As this video shows, these can enable designers to see and access the underlying grid in their designs and allow then to adapt them on the fly. There's also really interesting development in the use of holding devices, making it much easier for designers to use shapes other than the squares and rectangles that predominate across the web. Richer more interesting layouts will suddenly become that much more possible. The themes of voice, character and distinctiveness echoed throughout the day. As did the potential of new tech to help do things differently. I get very excited about these kinds of things but I truly felt the day was a call to arms – let's standout and let's do things different! But what does that mean for us and our brand? Our ambition is to be the most authentic, relevant and creative brand in tech consultancy. We have two beautiful typefaces to work with (Sentinel and Proxima Nova) to help us achieve that aim, but we can be bolder, more surprising and perhaps more single-minded in how we use them. I think it's time to do a bit of an audit of what we have and some experiments on how to make it all work a bit harder. Let's get to work. How are you making typography work for you? Let us know.